On a clear but cold winter's afternoon of the 4 th January St Nicholas Church, attractively decorated with flowers, was packed with relatives, working colleagues and many residents from around Longparish for the very moving funeral service for Jane Sterndale-Bennett. She died at the age of 63 on Christmas Eve in Winchester Hospital having been diagnosed with cancer only five weeks earlier. Jane was born and brought up in Norfolk. Her father, Major Frederic Fitch M.C., was killed during the Normandy landings in 1944 and in the 1950s she lived in Kenya where her step-father was a District Commissioner. She arrived at White Windows in Longparish in 1979 to a garden which had been derelict for two years. This gave her an opportunity to start with a blank canvas. Her aim was to create an informal country garden which would look attractive throughout the year. Hardy perennials were chosen as the mainstay of the garden alongside a full range of trees, shrubs and other plants. Foliage held the garden together adding interesting shapes and a wide variety of leaf colours. She was an artist who painted with flowers. The garden, which has become a Mecca for garden lovers from many parts of the globe has been featured several times on TV, in gardening books and magazines, and is frequently highly commended in guide books. Gardening Which? rated it as third in its class in the country. In 1980 she joined the newly formed Hampshire group of the National Council for Conservation of Plants and Gardens, serving as Hon Sec from 1985 for ten years, held part of their National Collection of Hellebores in her garden and also played a leading role in their Chelsea Flower Show Exhibit in 1991. In 1982 she joined the Hardy Plant Society and has been at the heart of their activities for the past twenty years, tirelessly serving on several committees and finally as Chairman from 1996 to 2001. Again she played a leading role in creating the displays that gained silver medal awards at the Chelsea Flower Shows of 1989 and 1998. Drawing on her personal experiences and supported by her own very high quality slides she became much in demand as a popular lecturer (and occasional judge) not only throughout Hampshire but right across the UK and abroad to Ireland, France, Canada, the United States, Japan and New Zealand. 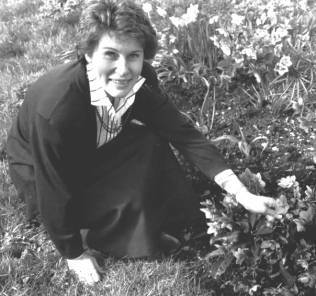 At the same time she was a regular contributor to several gardening journals, a weekly columnist for the Southern Echo, and a Consultant for the recently published Hillier's Plant Names Explained . In 2002 she was elected a member of the prestigious Garden Writers Guild. At the time of her untimely death, she had just completed writing Hillier's The Winter Garden, due to be published in late 2006. As if all this was not enough, when she arrived in the village their neighbour, Sally Birnie, immediately co-opted her to help with the plant & produce stall. For 17 years Jane ran the stall at the Fete and helped with the May Fayre stall. In 2004 she helped to manage the very successful village gardens open weekend to raise money for the renovated School. She loved the countryside and was often to be seen walking Bumble, her beloved Norfolk terrier. Throughout her time here she was part-time secretary to Graham Darrah, who gave the address at her funeral. Despite her many public achievements Jane was essentially a very modest, dignified and private person. She married Barry Sterndale-Bennett in 1964, thereby becoming part of a distinguished musical family. She was very proud of her son Mark and her daughters Erica and Victoria and devoted to her six grandchildren. Barry and family would like to thank all of you who made contact with expressions of condolence and support. This is greatly appreciated.